In the late 1950s, the Party leadership used its influence over the mass organizations to initiate a variety of campaigns that aimed at creating mass support for their ambitious plans in terms of economic performance and in terms of changing the structure of society. These campaigns went along with numerous competitions, with slogans such as „Arbeite mit, Plane mit, Regiere mit“ („take part in the work, take part in the planning, take part in the government“) or „Greif zur Feder, Kumpel!“ („take up your pen, miner/mate (synonymous in German)“), " Für Frieden, Wohlstand, Glück, decken wir den Tisch der Republik" ("For peace, welfare and happiness, we are setting the table for the republic’s birthday“), and "Pionierexpreß der guten Taten" ("Pioneer express train of good deeds"). At the Fifth Conference of the Socialist Unity Party (SED) in 1958, it was decided to 'complete the foundations of socialism by 1965'. Such abstract formulas contrasted strikingly with the complex nature of society. However, these slogans did not simply express wishful thinking on the part of the ideologists; they also served strategic aims. The Communist leadership was under pressure on the one hand to make life in East Germany more attractive in order to stop mass escapes, and on the other hand to catch up with the Soviet Union in terms of social change. 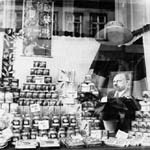 The main aims for the near future were to complete the collectivization of agriculture and to increase living standards by promoting the production of consumer goods. However, these aims turned out to be conflicting, as many farmers chose to leave the country, and the resulting shortage in the provision of agricultural products fuelled dissatisfaction with the regime in general. The leadership relied on several campaigns in order to motivate people to put the ambitious economic and political aims into practice. Thus a campaign was started to promote chemical industry under the slogan: "Chemistry provides us with bread, welfare and beauty". Chemical industry was considered a key factor in the plan to outdo the West German economy (see also Picture 30). At the same time, the ruling party SED went ahead with restructuring the educational system. In 1958, a new law on university education was passed, followed by the law on the "Socialist restructuring of the school system" in 1959, which created the so-called polytechnical school: a universal 10-year schooling, usually with a focus on science and work experience in industry. Artists and writers were addressed, too and given the task of creating a "Socialist national culture". The so-called "Bitterfeld Way", named after a conference which took place in the industrial town of Bitterfeld in 1959, meant that authors spent time working in factories in order to write about the life of 'the proletariat'. Workers, in turn, were encouraged to write creatively, under the motto „Greif zur Feder, Kumpel!“ („take up your pen, miner/ mate“). Through membership in mass organisations, nearly every individual was addressed by one or more campaigns. The only union which existed, the FDGB (Free German Trade Union), promoted competitions for the title "Brigade der sozialistischen Arbeit" – „team of the socialist way of working“. The Free German Youth, FDJ, committed themselves to so-called "youth projects" to help build up the economy. Children who were member of the "Pioneers" fulfilled minor tasks that were considered publically useful, such as collecting old newspapers for recycling, and their activities were recorded in so-called "red books of good deeds". This mobilisation served economic aims but also aimed at creating mass support for the project of building up „socialism“. It is hard to judge whether the ruling party SED believed that they could arouse real enthusiasm this way or whether they hoped merely to create an illusion. The resulting politicization of life was as all-embracing as it was superficial. People in the GDR were probably not very impressed by the "Ten commandments of socialist morality" which the Communist leader Walter Ulbricht proclaimed in 1958; but hardly anyone could escape membership in mass organisations and ideological involvement in daily life – unless they openly went into opposition. The selection of photos for the section „Mobilisation“ is not limited to the campaigns of the late 1950s. They show a variety of situations where the population is incited to play an active role in society, with the price of political complicity. Also relevant in this context are the sections „Parades“ and „Slogans“.